When I recently cut up and baked a pumpkin for a pie (Click here to read about baking a pumpkin), I saved all the pumpkin seeds for toasting later. It had been a long time since I’d toasted pumpkin seeds so I had to do a little research to refresh my memory. I read several suggestions saying to clean the seeds by putting them in boiling water for 20 minutes. I gave that a try and it did get the seeds nice and clean, but I had to let the pumpkin seeds set out overnight to dry out again. 1. 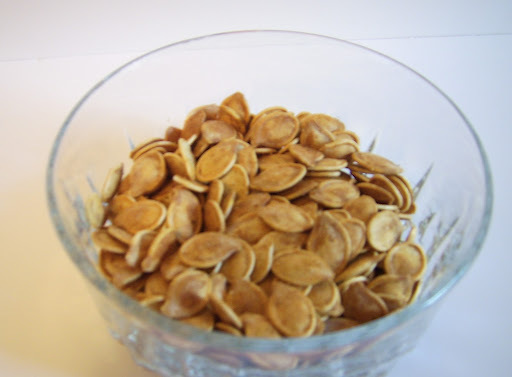 Place pumpkin seeds in a bowl. 2. In another small bowl, combine the melted butter, worcestshire sauce, and seasoning salt. 3. Pour the butter mixture over the seeds and stir until well coated. 4. Spread out in a single layer on a baking sheet and bake at 250 degrees for an hour, stirring occasionally. Hubby said these turned out just like he remembered from his youth . . kind of like chewy popcorn. Was that a compliment? Hmmmmm, not sure.